You must have seen students playing with footballs, tennis balls, table tennis etc. These all are the examples of Sphere in 3-dimensional geometry. When a semi-circle is rotated across its diameters then it will become a Sphere. 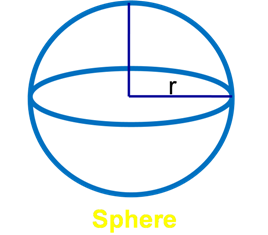 The radius of Sphere would be equal to the radius of a semi-circle. A Sphere is the locus of points in space that moves in such a way that its distance from a fixed point always remains constant. The fixed distance is measured as radius and the fixed point is measured as the center of the Sphere. You must be wondering what the difference between a Circle and the Sphere is. The circle is a two-dimensional figure and the Sphere is a 3-dimensional figure in the plane. If the length of the radius is made twice then it is converted to the diameter of the Sphere. This is a perfectly symmetrical shape where all points are equidistant from the center. There is no edges or vertices in case of a Sphere. It has one surface not flat. This is not a polyhedron. Where r is the fixed distance from the center point or we can call it the radius of Sphere. With a list of complete Sphere Formulas, this is easy to calculate the surface area, curved surface area, and the volume of the Sphere. You just have to put the values in formula and solve any typical mathematics problem. This is important to learn Cylinder Formulas during your school days because they are frequently used in day-to-day life too. Also, they are helpful in preparing yourself for competitive exams. Question: Calculate the diameter, circumference, surface area and volume of a sphere of radius 9 cm ?